"This is not just another textbook describing basic information about a multitude of assessments. The authors in Tests and Assessments in Counseling help readers understand the importance of making results meaningful and useful to our clients. Each chapter describes how to help test subjects make connections across instruments and better understand themselves. This strengths-based approach is a much-needed addition to the assessment literature!" "Tests and Assessment in Counseling accomplishes what few, if any, textbooks on this topic have in the past: appreciating the individual and deeply contextual nature of assessment. 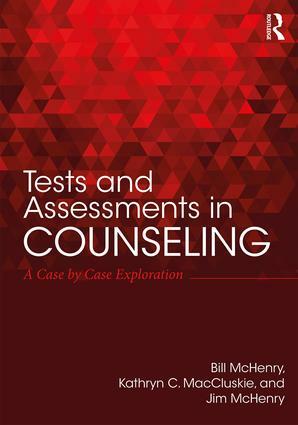 Each author successfully captures the process of assessment through a deep dive into a case, and this approach is designed to help counselors in training understand the nuances and uniqueness of testing and assessment with each and every potential client. This text is an important addition to master’s-level assessment courses." Bill McHenry, PhD, NCC, LPC, has coauthored/edited six books, dozens of peer-reviewed journal articles, and several book chapters in the field of counseling. He has presented at international, national, regional, and state professional counseling organizations. Dr. McHenry has been a counselor educator for fifteen years and has taught courses on tests and assessments throughout his teaching career. Kathryn MacCluskie, EdD, is a professor of counseling at Cleveland State University. She has authored/coauthored five books in the areas of clinical skill development, use of test data in clinical assessment, and becoming an effective counselor. Dr. MacCluskie has taught assessment courses for many years in the field of counselor education. Jim McHenry, EdD, NCC, CRC, LPC, has coauthored/edited five textbooks and numerous professional counseling journal articles. He is a professor emeritus and has taught nearly every course offered in a counseling program. His thirty-two-year career as a counselor and counselor educator includes working as a school counselor, mental health counselor, and rehabilitation counseling consultant. Dr. McHenry has taught appraisal techniques regularly throughout his career.